It’s a Hawaiian ‘dish’ made with raw fish that’s often tossed in a sauce like soy or shoyu and served with rice and sometimes vegetables. 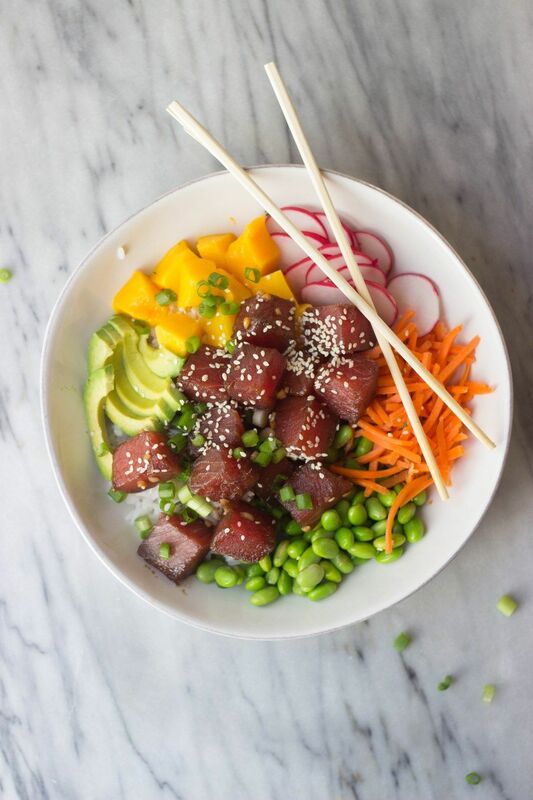 Fortunately, poke bowls are really whatever you want them to be, as long as your bowl focuses on high quality raw fish. In a medium glass bowl, whisk together soy sauce, brown sugar, rice wine vinegar, sesame oil, fish sauce, ginger and garlic until combined. Add cubes of fresh ahi tuna and stir to combine. Cover bowl and refrigerate at least one hour. In a medium glass bowl, combine chopped vegetables and rice wine vinegar; toss to combine. To assemble bowls: Spoon rice into four bowls. Distribute pickled vegetables, mango, avocado, and marinated tuna among bowls. Sprinkle with green onions and sesame seeds. Serve with spicy mayo, if desired.